We now offer our Springback Manuscript Binders in leather! They come in a variety of colors and can be custom engraved in a variety of fonts. They hold US Letter size sheets (8.5 inches x 11 inches). Tobacco Leather Springback Manuscript Binder – Outside. Click for larger image. Custom Leather Springback Manuscript Binder – Black suede inside – Click for larger image. We can sometimes get other, more exotic, colors. There is a field for that on the “request for quote” form. 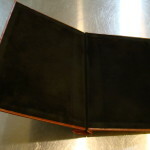 The “request a quote” page is a good way to get you thinking about your own customized leather springback binder. The usual turn-around time for these binders is 4 to 5 weeks, sometimes less. 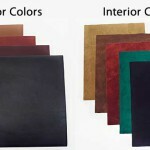 These custom engraved leather springback manuscript binders are hand-made items and so some variations in colors and turn-around times are possible. For rush jobs (less than 4 weeks) we often have to charge a rush fee of $50. To insert pages into a springback binder, you bend back the covers until they almost touch and the clip opens. The binder comes with a black tagboard folder to hold your pages. You just insert the folder with the pages (or the pages alone) and return the cover to the “closed” position. Here is the page for the regular Springback Manuscript Binders. They are much less expensive and the turn-around time is much faster!